The 35-story Block 216 tower was approved in December. Our post about the project’s Design Advice Request was our most popular post of the year. 2018 is the fourth full year Next Portland has been in operation and I’m excited to see what 2019 brings. I’m currently on vacation in Scotland, so new posts will continue to be sporadic until I return next week. Last year was another busy year for the site. Of the course of the year 141 new posts were published, with nearly 900,000 page views. The year started with the last of the pre-inclusionary zoning (IZ) projects working their way through the design review process. In February it was reported by the Portland Mercury that Portland’s inclusionary zoning mandate was getting lackluster results, with only 12 qualifying building in the pipeline. By the end of the year Next Portland had posted about a number of large post-IZ developments that have been approved through design review. These include 815 W Burnside, 1715 SW Salmon, Nomad, the ART Tower Block 216, 1935 N Killingsworth and the Pepsi Blocks. The Portland Housing Bureau now estimates that there are 43 projects subject to inclusionary zoning in the pipeline, with 362 affordable units in projects that have permits or are close to permitting. Despite the uptick in post-IZ proposals, new design review and building permit applications remain down relative to years ago. At the end of the year the Bureau of Development Services was forced to lay off staff for the first time since the recession, citing “quite sobering” forecasts. Similarly to 2017, many of the most popular posts were published in previous years, a reflection of the fact that the content Next Portland remains relevant for a long time, as buildings move through construction and into occupancy. One post in the top 25 most popular posts was from 2015; seven posts were from 2016; six posts were from 2017; and eleven were published in 2018. 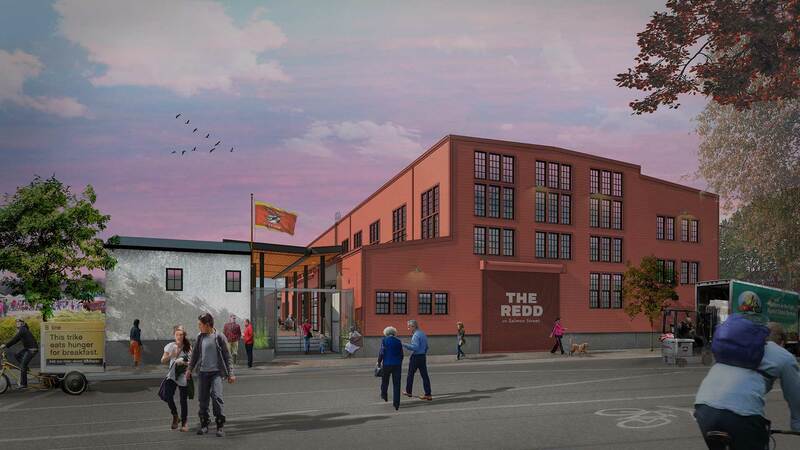 The Redd East involves the adaptive reuse of a 1918 ironworks building in the Central Eastside. Construction is nearing completion on the east building at The Redd on Salmon Street, the two-block food distribution hub by the Ecotrust. The Daily Journal of Commerce published photos of the progress made to date. 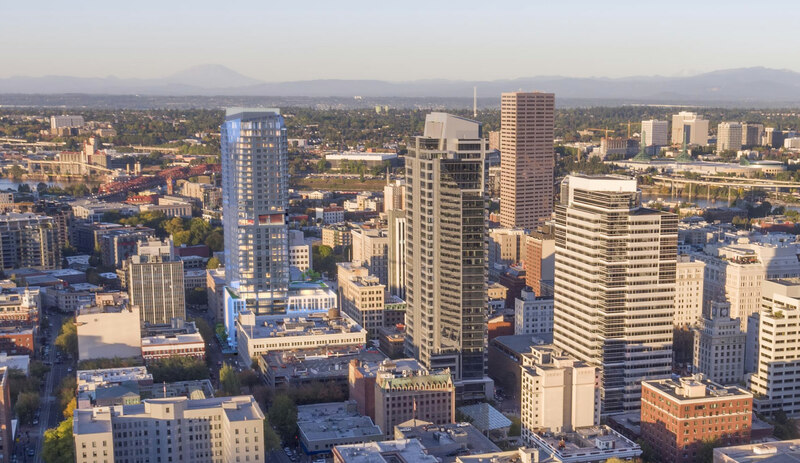 In what is believed to be a first for Portland, a quarter of the units at the TwentyTwenty Condominiums are being marketed exclusively to buyers who live in Asia, reports the Oregonian. The Daily Journal of Commerce published photos of the recently completed Garlington Place Apartments in Northeast Portland. The 52 unit development includes a mix of homes designated as affordable to people earning under 60% of median family income, for veterans, and for clients of the adjacent health clinic in critical need. 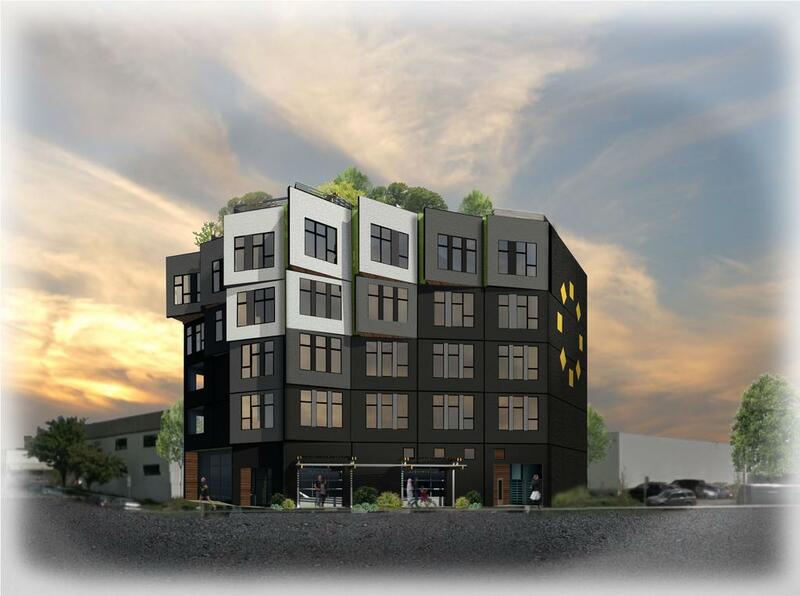 The Oregonian reported that the 148-unit affordable housing development at 1727 NW Hoyt St was approved by the Historic Landmarks Commission. Housing activist and attorney Alan Kessler has filed a lawsuit against the City of Portland, over the high cost of extracting public records, according to the Willamette Week. Kessler had requested records related to the involvement of one of the members of the Landmarks Commission during early Design Advice Request meetings. 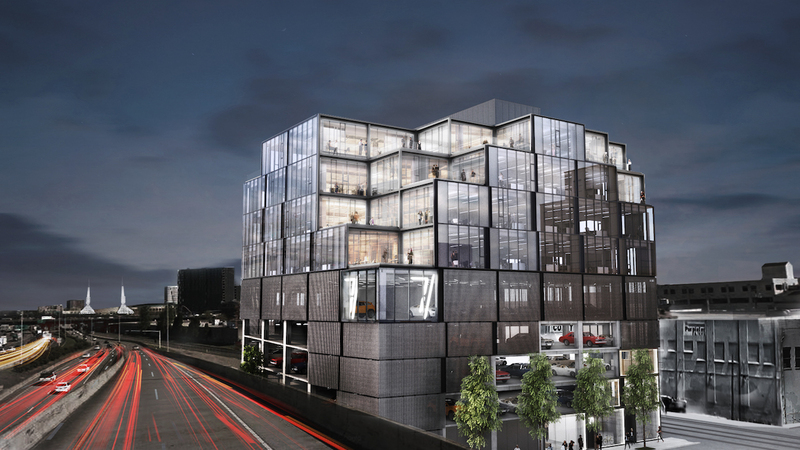 GBD Architects’ design for Block 216 would rise to a height of 460 and include 35 floors. An 51-unit apartment complex at 10506 E Burnside St will be the first newly constructed building purchased with funds from Portland’s housing bond, reports the Willamette Week. The Metro Council voted to send a $652.8 million affordable housing bond to the region’s voters, despite last minute opposition from Washington County Chair Andy Duyck. 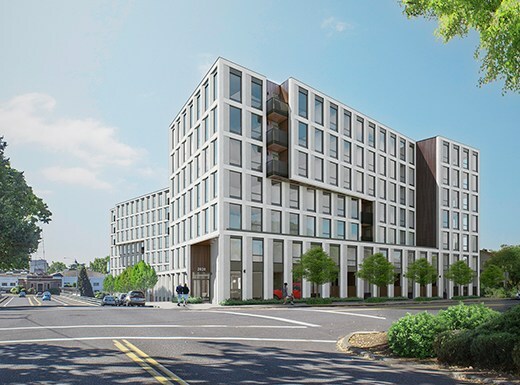 Architecture firm West of West published their unselected designs for the ODOT Blocks in the Central Eastside, prepared for developer Lincoln Property Company. Portland Architecture visited Portland State University’s new “ship in a bottle“, the Viking Pavilion. As Multnomah County prepares to dispose of the 1914 Multnomah County Courthouse KATU reported that locals hope it is preserved after the sale. Portland Monthly looked at TwentyTwenty and asked whether Portland’s condo market will make a come back. Construction is underway on TwentyTwenty, a 162 condominium development at NE 21st Ave and Multnomah St desgined by Hacker architects for PHK Development. 172 parking spaces will be provided in two levels of below-grade parking. The building will also include 179 bicycle parking spaces. TwentyTwenty is one of only two large condominium buildings currently under construction in Portland, the other being the Vista Pearl. OPB reporting on how Portland Art Museum is adapting plans for the Rothko Pavilion in order to win over critics. According to the Oregonian the bidder that intended to purchase an Alaska ferry for use as a floating hotel at 2260 NW Front Ave has backed out of the deal. The Willamette Week reported that Lents will get a new craft beer bar with food carts, in a currently under construction development at 9316 SE Woodstock Blvd. 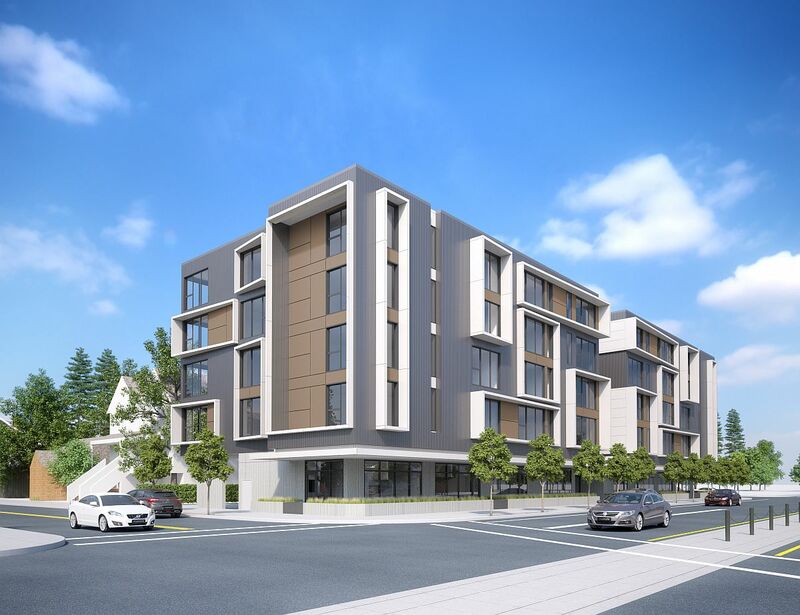 The Hollywood Star News reported on the construction of a seven-story, 162-unit condominium project at 1177 NE 21st Ave. The DJC published photos of the self storage building rising at 910 SE 7th Ave.
Prosper Portland, the agency formerly known as the Portland Development Commission, struggles to make money from the property it owns, writes the Oregonian. 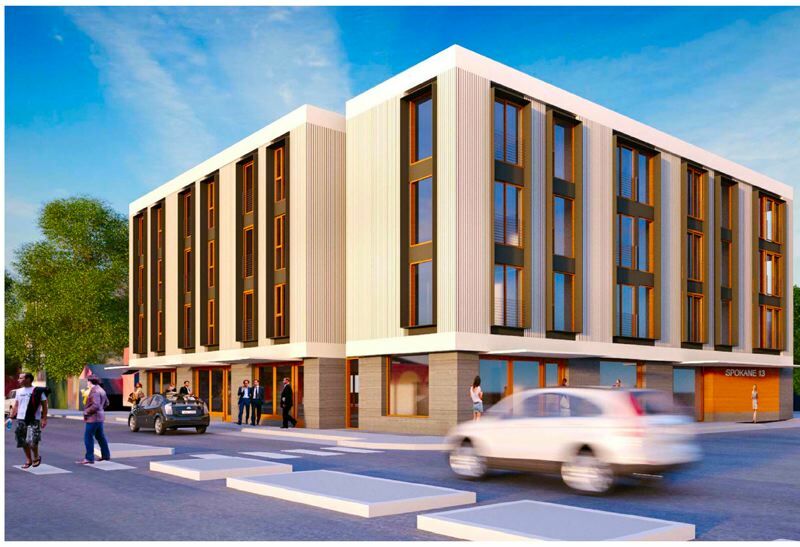 Portlanders for Parking Reform wrote about how a project at 1717 SE Tenino St will include less affordable housing but more parking spaces, as a result of city regulations. 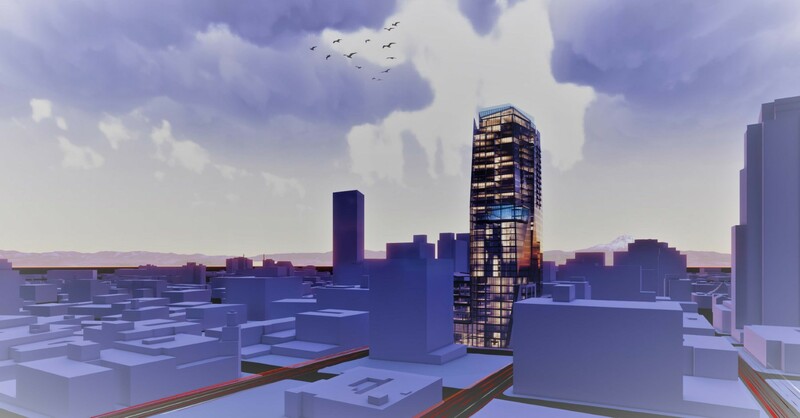 The NW Examiner looked at conflicting opinions of Pearl District residents regarding views of the Fremont Bridge that would be blocked by the Fremont Place apartment tower, which is currently going through design review. The Portland City Council approved financing and transfer of the land for Block 45. With all 240 units now planned to be affordable, the building will be city’s largest single building affordable housing development in 50 years. The Portland Mercury reported on how the Republican tax plan would eliminate eliminate private activity bonds, a tool commonly used to fund affordable housing projects across the country. The Willamette Week looked at a potential conflict between two of Governor Brown’s priorities, timber towers and clean air. Hassalo on Eighth, the Lloyd District superblock development by GBD Architects and American Assets Trust, reached its full height. The names of the three buildings were announced: the Aster Tower; The Elwood; and the Velomor. Also in the Lloyd District, restauranteur David Machado plans to open two new restaurants in the Hotel Eastlund. Altabira City Tavern will be a rooftop restaurant with a beer centric menu, while Citizen Baker will be a bakery, cafe and wine bar. The venue Revolution Hall opened this week in Washington High School, an adaptive reuse of an old high school by SERA Architects and Venerable Properties. Portland Monthly listed five things you don’t know about Rev Hall. David Greenwald of the Oregonian reviewed the first show, Wild Ones and Alialujah Choir. The Portland Tribune profiled Bob Ball, CEO of development firm Astor Pacific. In it they revealed that his next project will be a four story, 35-unit apartment with corner retail at 901 NW 21st Avenue, near Caffé Mingo. Two retail buildings in Sellwood were demolished to make way for the VWR Development’s Spokane 13 Apartments. The design is by TVA Architects. PHK Development and THA Architecture released details of their proposed 7 story apartment at 2034 NE Multnomah. An adjustment review for the project was approved in December 2014. The Portland Business Journal reported that the PDC has issued an RFI for the Old Fire Station Property at NW 3rd & Glisan. It could potentially be converted into creative office space. Portland Architecture published an interview with Eugene Sandoval of ZGF Architects. Notable projects of his include the Eliot Tower and Twelve West.